PracticeLink.com W INTER 2019 61 features t H e Q UAL it Y OF Li F e i SSU e ▲ ▲ ▲ DEBBIE L. MILLER P R ACTICING M e DICIN e h AS N e V e R B ee N AN easy profession. But it's also not getting any easier. Perhaps that's what makes burnout not only a reality, but also on the rise—and rising fast. Tait Shanafelt, M.D., chief wellness officer of Stanford Medicine, has found that burnout rates among physicians are now twice as high as that of professionals in other fields. In the most recent data from a national research study, Shanafelt found that nearly 49 percent of physicians reported burnout, as opposed to 28 percent for other professionals. Although physicians of all ages and time in practice can and do suffer from burnout, it's actually the younger physicians who seem to be particularly at risk. 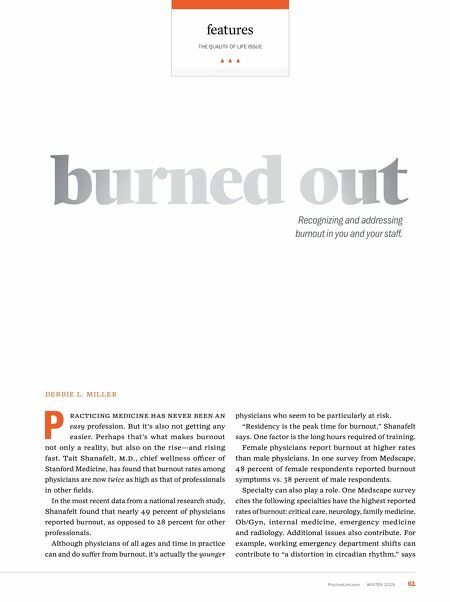 "Residency is the peak time for burnout," Shanafelt says. One factor is the long hours required of training. Female physicians report burnout at higher rates than male physicians. In one survey from Medscape, 48 percent of female respondents reported burnout symptoms vs. 38 percent of male respondents. 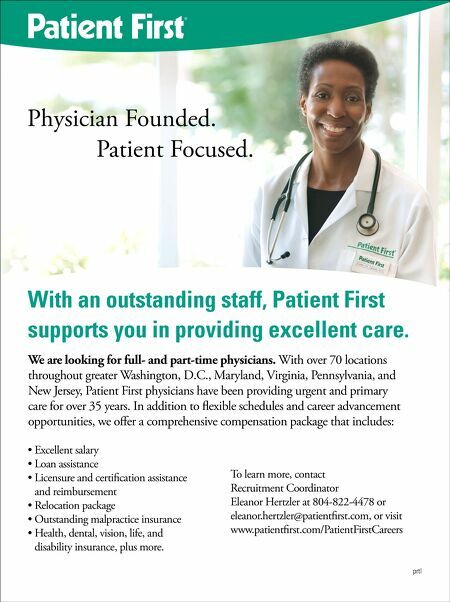 Specialty can also play a role. One Medscape survey cites the following specialties have the highest reported rates of burnout: critical care, neurology, family medicine, Ob/Gyn, internal medicine, emergency medicine and radiology. Additional issues also contribute. For example, working emergency department shifts can contribute to "a distortion in circadian rhythm," says b ur n ed o u t Recognizing and addressing burnout in you and your staff.